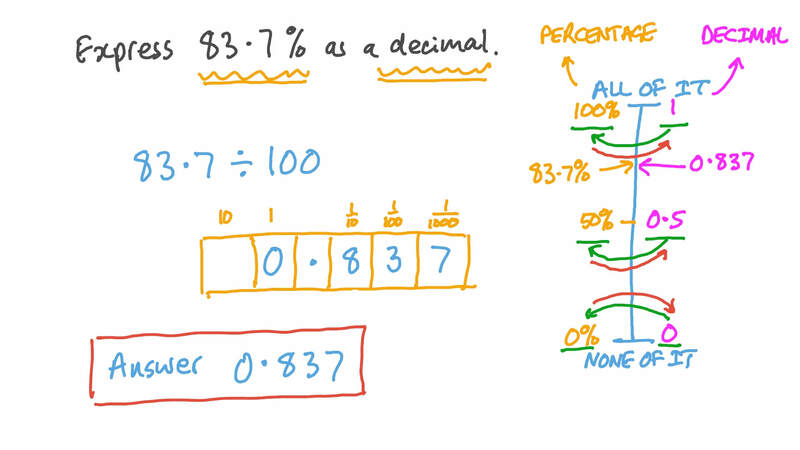 In this lesson, we will learn how to convert percents to decimals for a set of rational numbers. 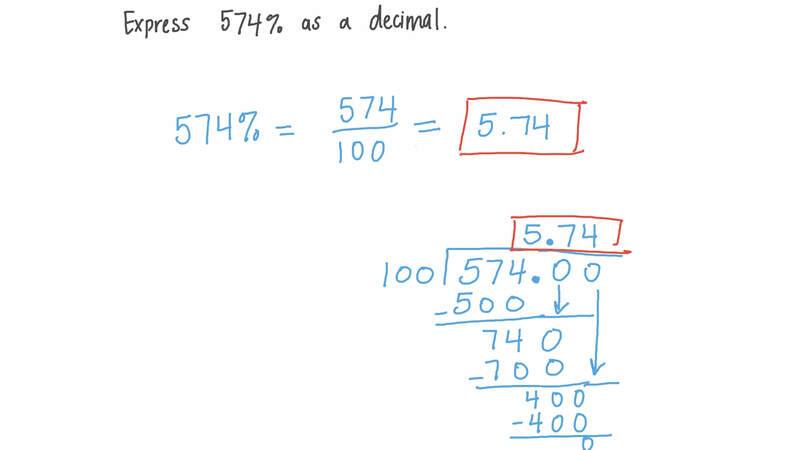 Express 5 7 4 % as a decimal. Express 0 . 5 2 % as a decimal. Express 8 3 . 7 % as a decimal. Express 4 4 % as a decimal. Convert 4 6 2 5 % into a decimal. If the sales tax in a town is 2 . 3 4 % , express the percentage as a decimal. According to a recent survey, 2 1 % of people prefer apples over oranges. Express 2 1 % as a decimal. Express the percentage that represents the colored parts of the given figure. Nader did of the yard work while Maged did . Which decimal represents the amount of work they completed together? When preparing a cereal bowl for breakfast, 6 3 % of people put the cereal in first. Express 6 3 % as a decimal. A percent is a fraction where the denominator (i.e., the whole) is 100. In the diagram, a 100-centimeter ruler has been used to represent the whole. What is the length of the shaded part in centimeters? What percent of the ruler is it? If now we use meter as a length unit and the ruler is one meter long, what is the length of the shaded part in meters? The ratio of the length of the shaded part to that of the whole ruler can be expressed as a fraction, a percent (which is a fraction where the denominator is 100), or as a decimal. In the latter case, the decimal can be interpreted as the length of the shaded part when the whole is 1. Give this ratio as a decimal. Convert 3 2 . 8 9 % into a decimal. What fraction of a number is equivalent to 5 0 % ? Determine which of the following numbers is not equivalent to 2 5 . 6 % .